I am always keen to talk about my work to broadcasters, and have extensive experience as a radio interviewee, and as an on-screen “talking head” for drama-documentaries. After successfully championing George Washington as the British Army’s most formidable opponent at an event held at the National Army Museum, Chelsea on 14 April 2012, I gave several radio interviews – live from Chelsea to BBC Radio 4, and subsequently to Boston-based PRI’s ‘The World’, and to Radio New Zealand in Auckland. My case for Washington drew upon the arguments that are detailed in my book ‘George Washington: Gentleman Warrior‘. Drama-documentary on the Cherokee Wars of 1760-61 by Nolpix Media (Knoxville, Tennessee). Broadcast on PBS. Winner of 2013 Award of Distinction, East Tennessee Historical Society. My contribution focused on the style of frontier warfare and the importance of Indian allies. PBS, Mountain Lake, 60 minute drama-documentary exploring the French and Indian War in Upstate New York, first broadcast across US in 2009. Supporting material included interviews with contributors and short features including ‘The Ranging Way of War’. 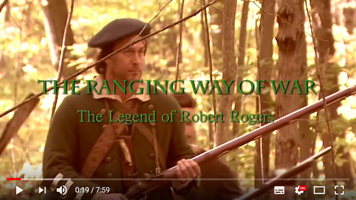 I spoke about Robert Rogers and his Rangers, drawing upon research for my book ‘White Devil‘. 70 minute drama-documentary by Gala Film (Montreal) and Gedeon (Paris), first broadcast by History Network (Canada) and ARTE (Europe), September 2009. I was invited to participate following the publication of my book ‘Paths of Glory: The Life and Death of General James Wolfe‘. This included a major reassessment of Wolfe’s generalship at Quebec and this was my main focus for the interview. Half-hour radio documentary broadcast worldwide by Radio Netherlands, 5th and 7th May 2004. Throughout the history of warfare, technology has changed rapidly. What hasn’t changed are the underlying emotions of the soldiers who must fight those wars. ‘Soldiering On’ looked at the experiences in battle of two soldiers from the Second World War and how their emotions could be seen as a template for soldiers through the ages. Drawing upon my own research into earlier periods of military history I helped give examples to support this case. 46 minute documentary by Yap Films, Toronto, broadcast on History Television, Canada in 2007, and since repeated. 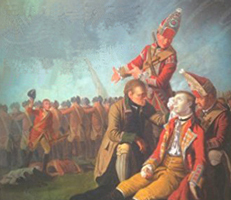 This film, shot on location in London and Quebec, investigated the theory that General James Wolfe was sniped at Quebec by one of his own disgruntled men. 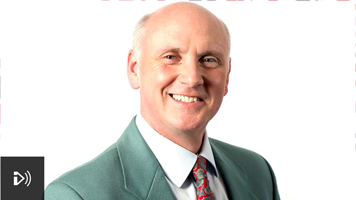 It is presented by Wolfe’s descendent, journalist Andrew Wolfe-Burroughs. I was interviewed at Greenwich, where Wolfe is buried, and spoke about Wolfe based upon research for my book ‘Paths of Glory: The Life and Death of General James Wolfe‘. 82 minute film by Paladin Communications, produced on video and DVD in 2003. In 2001 Paladin Communications released When the Forest Ran Red: Washington, Braddock and a Doomed Army. This sequel, George Washington’s First War: The Battles for Fort Duquesne, begins where Forest concluded, with the shocking defeat of Gen. Edward Braddock’s ‘invincible’ British army in the Ohio country by a French-Indian allied force from Fort Duquesne. It is left to Braddock’s young aide, George Washington, to lead the retreat from the battlefield. 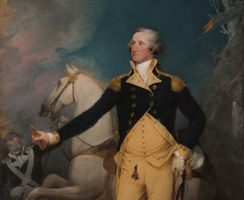 For three years Washington matches wits with an enemy he calls ‘the most skilled in the world’. Finally the British government launches a new attack against the French stronghold of Fort Duquesne, with George Washington in the lead. Here Washington will face his greatest challenges of all. My contributions drew upon the research that I was gathering at that time for my book ‘George Washington: Gentleman Warrior‘. 85 minute (plus extras) film, by Paladin Communications, produced on DVD in 2006. This is the final film of Robert and Mary Matzen’s award-winning drama-documentary trilogy on the young Washington. It includes convincing live action sequences, tight direction, and contributions by on-screen historians including me. Order and more information from Amazon US. 68 minute film by Paladin Communications, produced on video and DVD in 2004. 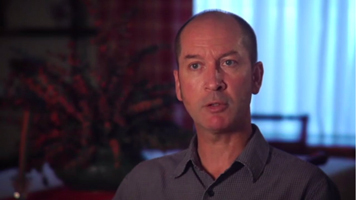 This ‘Director’s Cut’ of the successful 2001 original film incorporated extra footage and featured a new interview with me. This became America’s most popular and highly decorated feature documentary about the French and Indian War of the following decade. When the Forest Ran Red: Washington, Braddock and a Doomed Army was a ground-breaking film chronicling the opening days of the war, which helped to set America on the road to revolution a generation later. The film aired in major markets across the United States, earned five national awards, and was sold into secondary school systems and universities from coast to coast. I spoke about Braddock’s army, based upon the research presented in my book ‘Redcoats: The British Soldier and War in the Americas, 1755-1763‘. Half-hour radio documentary broadcast worldwide by Radio Netherlands, 7 & 9 July 1999. Smallpox is a forgotten enemy to many people now, but its horrors were an ever-present threat until only a few decades ago. 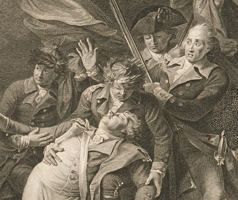 This radio documentary examined the history of human relations with the disease, from early records of epidemics across Europe, through its use as a biological weapon in the eighteenth century, to the eradication effort of the 1970s that saw the smallpox virus confined to just two research laboratories. Pulling the Plug on Pox asked whether the eradication procedure should be carried through to its ultimate conclusion and the captive virus destroyed, or whether terrorist threats (then only a vague concern) demanded survival of the organism. 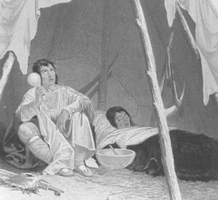 My contribution explored the controversial distribution of infected blankets by the British army to native populations during ‘Pontiac’s War’ in 1763. 45 minute feature on BBC Radio Lincolnshire, broadcast on 13 June 2004. This edition of the popular ‘Howard Leader‘ programme was devoted to an interview with me, and a discussion of ‘White Devil‘.